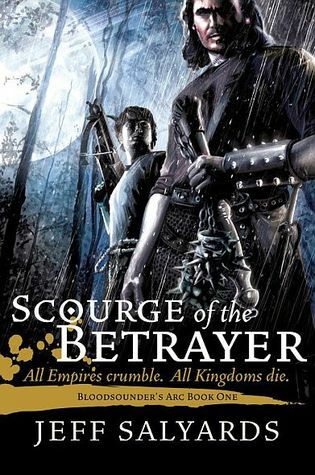 Book 1 of "Bloodsounder's Arc"
SYNOPSIS - Many tales are told of the Syldoon Empire and its fearsome soldiers, who are known throughout the world for their treachery and atrocities. Some say that the Syldoon eat virgins and babies–or perhaps their own mothers. Arkamondos, a bookish young scribe, suspects that the Syldoon’s dire reputation may have grown in the retelling, but he’s about to find out for himself. “I'll tell you this much. Men think memories are like murals or statues or truth or whatever happened, never changes none. But that ain't so. They can capture the untruth of something, just as easy. They can change, especially as time leads to time. FL Speak - Where do I start about this book? The lack of a plot or the immensely lovable uncouth humour? The fantastic characters or the whirwind action sequences? Scourge of the Betrayer takes you on a ride alongside ill-disciplined mercenaries where swords and flails speak mightier than the words of the scribe through whose POV we muddle across. An opportunist meets an unpredictable man and is left to make choices he never imagined were choices. Stuck between a rock and hard place, our scribe Arki attempts to pierce the mystery of the Slydoon in hopes of seeing himself in a glorified pedestal. I love such books. I am a sucker for teams and cadres. Be it the Bridgeburners, the Mad Lancers or the Band of the Red Hand. If there are people worth following into battle, I invest more than a little emotion into them. The Slydoon is one such group. Jeff Salyards takes us on a nightmarish journey of gut wrenching fight brutality and a plot loosely tied around the outcome of such fights. There is a larger story. There has to be. But for once, I'm glad to read a book without thinking too far ahead.